Has one of our newest DIYers found a way to tame the illusive HiFiMan HE-6? Can the Sennheiser HD800 be redressed into a finer suit? Read on and be told a story of failure and success, starring everything from Schitt to silver, the only things left out will be MP3s. Yes fanboys, even Beats by Dr Dread will get a mention…. Last weekend I got the opportunity to witness something special in the headphone world that very few people in the UK will have had the chance to hear. Those in the HE-6 forum and the HD800 need to read on carefully; someone has been reading and understanding what many of the more knowledgeable folks have been saying. I believe Dillan has found a way to solve some of the problems inherent in squeezing out the best both the HE-6 and the HD800 can deliver. Last weekend I travelled from the left hand corner of the UK (Cornwall) to the right hand corner(Suffolk) to see my good friend Dillan(@dill3000). Dillan lives in a pretty splendid setting in a huge house tucked away from some of the larger towns like Ipswich and Norwich. We were lucky enough to have the house to ourselves so we could talk headphones undisturbed by the stresses of normal life. Dillan McNeish is a graphic designer by profession. Many of you won’t know this but Dillan supplied the logo for the SoCamJam held in Cambridge in April of this year. I was lucky enough win a T-shirt sporting the design at the meet, Andy(@smial1966) certainly knows how to put on a raffle at a headfi meet! With congratulations to Andy and Mark(@pedalhead) for organising such a momentous and sociable gathering of fellow geeks from all across the country and into Europe. Ye gods I won 3 prizes! But more on luck later. Unbeknown to me Dillan had attended the London calling meets cordially hosted by Nadim(@gsarider) back in 2013 on not one but two times at the Great Russell Hotel in the heart of London. All through this period our designer was watching listening and learning, refining the knowledge base he now possesses. I got a chance to pick our resident experts brains over some of the best Espresso this side of Naples. 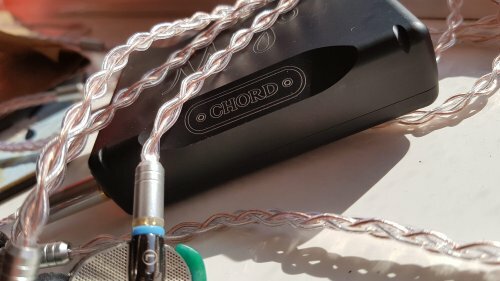 Although many of us might find this daunting, given enough time and patience, a DIY Amp build can bring an exotic slant to the High End Headphone Community, that which only a no compromise build can bring. And our Suffolk headfier learnt from scratch with only a distant memory of soldering at CDT class in Senior School…. Let me give you now a little glimpse of the first amp Dillan has created. He dubbed it “The Beast”. When it roars- you listen- in awe. During the Summer months The Beast reaches a cool optimal operating temperature of 51 degrees. Perfect for heating a room up to an uncomfortable level to thin the crowds out to the point where only the most dedicated headphone fanatics remain…..
Of course during the other 3 seasons it will replace the need for a slightly more expensive central heating system(please see Dillan for price comparisons). If only the Utility Companies could make their radiators sound this good ; maybe we wouldn’t be so tempted to complain about the rising prices even when crude is falling. Let me tell you ; for those who have not had the privilege, there is nothing crude about The Beast. This is a pure class A Dual Mono Power Amplifier oozing in refinement. Made with the finest ingredients one can create the ultimate meal. This meal needs a big dish and a sturdy table too, and while we’re sat down a few table manners must be observed. But more on that later, I’ve hopefully whetted your appetites and we must move on…. The Beast was born from the immeasurably gifted and generous Nelson Pass, a gentleman who goes under the banner of First Watt in the USA. As a nod to his roots, and a testimony to his artistry, Nelson gives away his secrets to the DIY community once he has sold 100 units of each of his amplifiers. 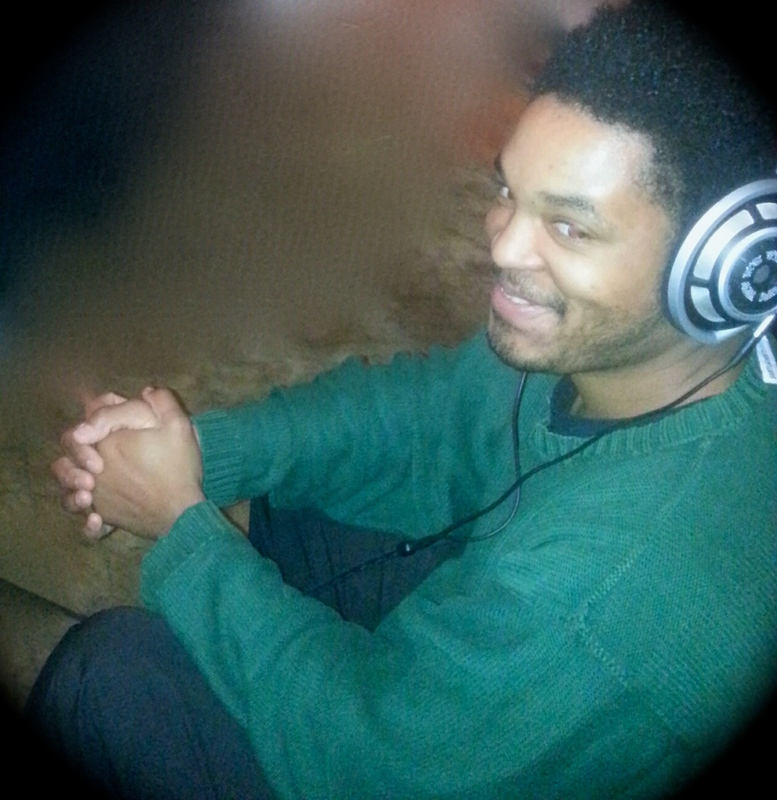 He then stops making them…..
Dillan did a lot more study on what makes a headphone great than I have and probably most of us ever will in our lifetimes. I mean, HAVE YOU SEEN THE SIZE OF THE HD800 and HE-6 FORUMS ON HEADFI????? They’re daunting ; dark and dangerous places in which mysterious characters with more money than sense lurk. Only the strong survive on these threads, newcomers must tread gently and carefully. Stand ready to be exposed if you have not read , absorbed and most importantly understood the contents of the first 1000 posts of each of these forums. You have been warned….. 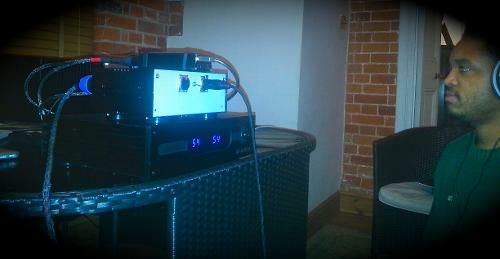 I spent some quality time at Suffolk gaining some knowledge as to how an amplifier is designed and matched to a speaker. In our case this is headphones. 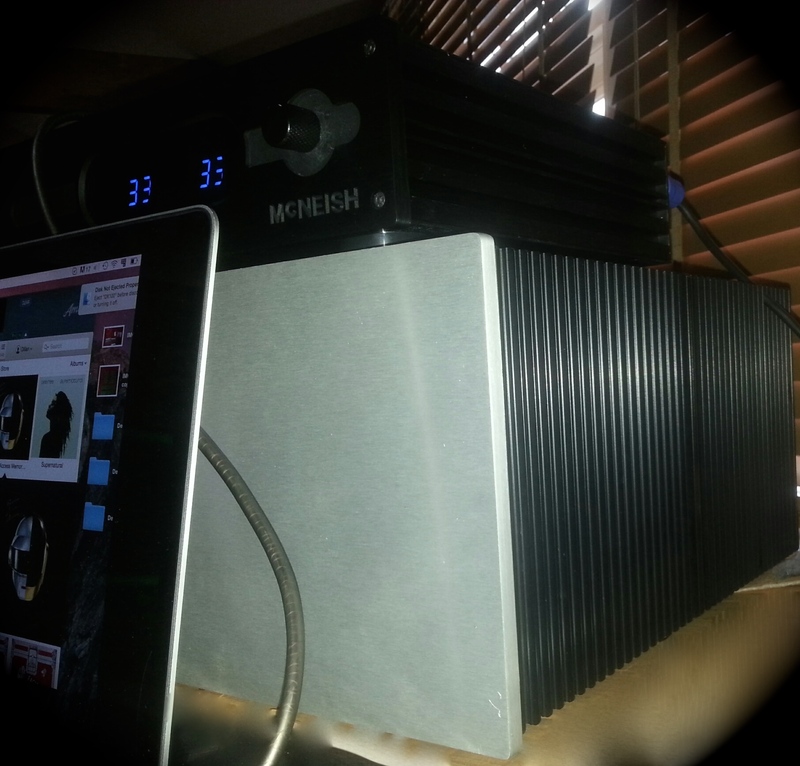 Clearly The Beast is designed for powering one of those old fashioned speaker set ups, some of you may even have one. But this is HeadFi! We’re not here to talk about speakers! Unless you can put them over, in or at least within a few inches of your ears. That is where the magic happens for us. There is an intimacy of a secret world conjured by a series of Sorcerers , Dr Fang and Axell Grell amongst them that belongs to an elite group of headphones. Speakers need a particular set of circumstances to perform at their best , a room needs to have the correct acoustic properties for instance, which is why the Royal Albert Hall has some rather strange looking mushrooms hanging off it’s ceiling. Headphones don’t need that, even the proportions of the head on which they cling to aren’t particularly important. They are expensive sure, but not in the same league as their larger high end cousins. The sound is arguably right up there with the best and the neighbours don’t complain because they are entirely unaware of our secret world….. 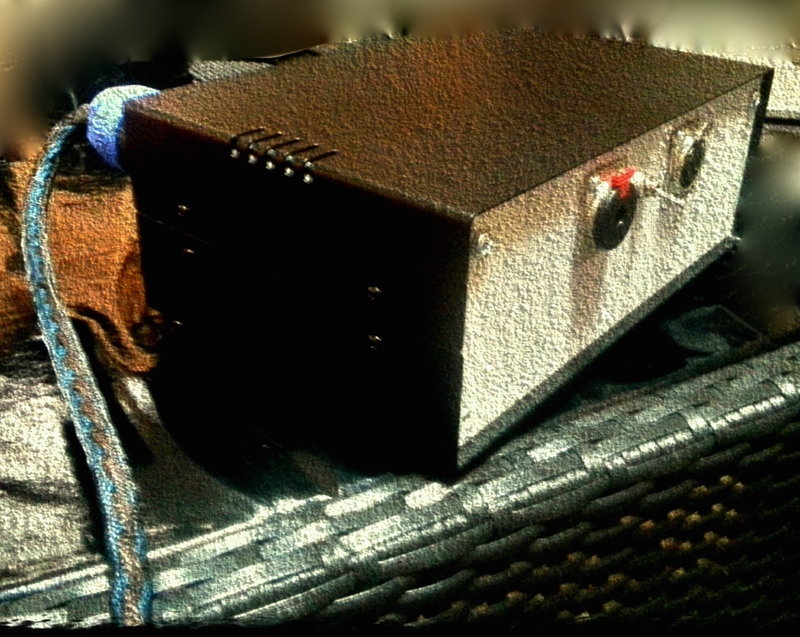 The Beast , believe it or not, is only 30 Watts per channel. 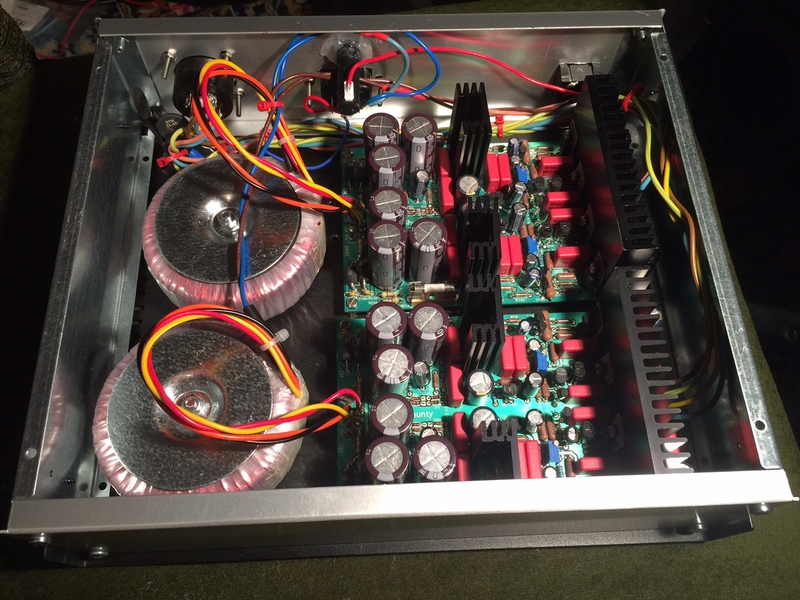 The First Watt Amp Designs are about powering to low levels with unusual designs. Dillan, like any great designer, could not resist making a few changes to the blueprints given to the DIY community by Nelson. The changes were significant and costly of course. Not content with tweaking the design parameters , he set about modding the HE-6 phones to remarkable levels. The cable has been changed to a balanced (DIY built naturally) the outside grill removed, blue tack has been placed all around the inside of the drivers, Vegan Ear Pads have been purchased instead of the stock velours, sorbathon patches appear at strategic places around the outside of the cups, and a partial extra damping on the outside of the driver ring. All designed to eliminate vibration and ringing noticed by Dillan himself and verified by some headfiers whose opinions are valued. The results of our designers first efforts were taken to SoCamJam in April 2015. Somehow that monster was transported up by train to the Hall! Unfortunately all the effort was in vain ; one of the guests started fiddling around with the connections at the back with the amp volume turned on presumably quite high while Dillan was away from his amp. The Beast blew out both HE-6 drivers. A hole could plainly be seen through one of them. Back to the drawing board…. We come nearer to the present , Dillan , thanks to the efforts kindness and goodwill of some unsung heroes who I can’t name got some replacement drivers and the HE-6 phones are as good as ever. Some brief thoughts on the potential shortcomings of the HE-6 are they don’t perform well without plenty of power. Underpowered Amps result in a thinner harsher sound. 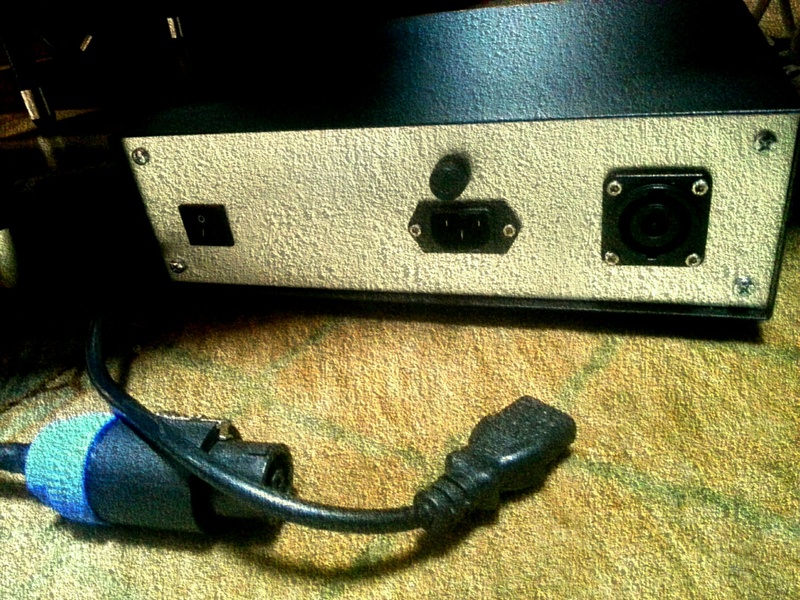 Power is nothing of course without refinement ; in short a decent amp is needed as well as a powerful one. And Dillan goes further; he has chosen a design which pushes lots of current as he believes this is what the HE-6 seeks. I spent some quality time this weekend listening to track after track, I have 3 years with my HD800s and have listened and adored the Orpheus on a couple of occasions and the SR009 BHSE combination amongst others. The SR009 BHSE combination I had picked as my retirement package and I didn’t think it could be beaten. 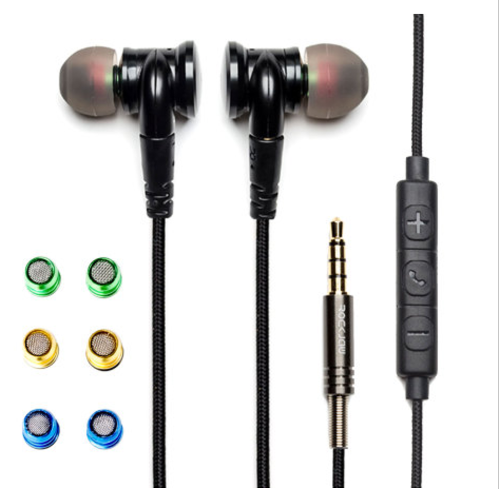 My mind was unswayable , anything below the SR009 combo was not as nice sounding to me as my slightly modded HD800s. Mark’s HE1000s are stunning and many people prefer this sound hands down compared to the HD800. My ears are tuned to the huge soundstage and the micro detail of the HD800s and were stuck in their ways. I listened to my first set of HE-6s and was smitten by them immediately. Tom(@Ithilstone) and Dill had a pair each and brought them across to Oxford for myself , Micah(@glassmonkey) and Mark(@Pedalhead) to have a listen to. And the Beast , to my joy, was risen again! I would finally get the chance to hear this strange looking huge thing. AS soon as I was sat down with Dillan’s HE-6s on, I realised there was more to life than the SR009/BHSE, as good as that is. The sound these modded HE-6s bring when plugged into the speaker taps of The Beast is an experience I hope all of you readers might get to enjoy one day. The fullness of the sound , the accuracy of the instruments and the delivery of micro detail were mind-blowing. The music took on an effortless liveliness that is difficult for me to put into words. Whichever part of the music I could follow , from the drums to the vocals to the guitars , I could see no faults. At low listening levels the sound was also more involving than I could have imagined below the SR009 combination. I went through Phil Collins I Don’t Care Anymore from the HD Tracks Hello I Must Be Going! album which sounds good on most systems , on this it sounds incredible. I did not make notes at the time as to what I listened to and it all seems so long ago now, but I was taken , I was gone for the precious time I had in the clutches of The Beast. Which is not to take away from the brand new pair that Tom was kind enough to bring along and was hooked into a 25 Watt per channel NVA AP20 Integrated Amplifier with an added extra of an unbalanced headphone jack on the front panel. Unmodded , and my first ever listen to HE-6s , wow they sounded great! The sound was different from the HD800s and even at the unmodded stage my ears preferred the fuller sound of the HE-6s , even though I was losing out on some of the hugeness of the sound stage. Thanks to Tom and Mark and Electromod who lent us the huge Schitt Ragnarok, I was able to do a supertest and utilising the balanced and unbalanced I was able to listen to the stock HE-6 HE-1000 and my modded HD800s, comparing an HDTrack of Aretha Franklin at her soulful best. Swapping between all 3 and listening to the track over and over , my ears preferred the planar magnetic sound of the HiFiMan over the Sennheiser. The Senns sounded thinner overall and boomier in the lower regions than the HE models. What struck me was I still preferred the HE-6 sound to the HE-1000. The HE-6 just sounded right to me , whereas I think many will prefer the 1000s which have livelier wider sound with arguably even more punch with the bass. I must stress at this point that all 3 sounded incredible through the Ragnarok. Listening is a subjective experience and all opinions are welcomed, how else can we further our experience? I have a set of older ears, I am unable to hear beyond 14000Hz and my musical tastes lean towards Rock and Pop and much of that is retro ; heck even most of the contemporary I stuff listen to stuff sounds retro! I think Mark Micah Tom and myself were agreement with each other on that Saturday on the beauty of The Beast. That sound had a unanimous thumbs up and it was extremely difficult to prise any of us away from listening to our favourite tracks as if for the first time. Dillan also told us of 3 more projects in the pipeline ; the passive preamp for The Beast , an HD800 amp and a Mini Beast for the HE-6. Fast forward to the 17th and 18th October and 2 of the projects were nearing completion. The passive preamp is designed as a pure volume control for The Beast ; it is completely neutral sounding in it’s design spec. It looks spectacular too. The HD800 amp , with separate power supply, was finished as I was hooked into The Beast downstairs. Many hours may have passed, it’s difficult to tell. The sound was just as good as I remember, I was again transported. The journey was well rewarded even if it had been doubled. With a HiFiM8 as the source at the time of proceedings , the opinion was the performance could be pushed yet further still. 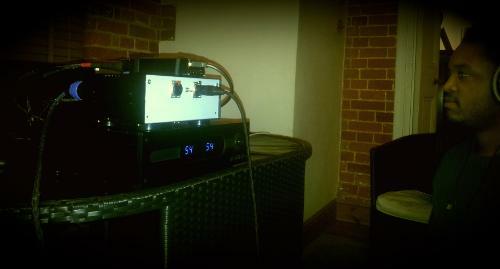 Dillan arrived downstairs to unveil the HD800 Amp and power supply. 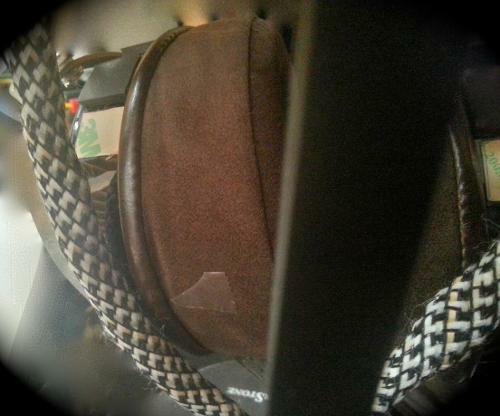 The HD800 as special as it is,has been being worked on by many of us Sennheiser owners. Both Dillan and I have applied our own preference to the Anaxilus mod. I likened the muffled results of my full mod to a pair of Beats and removed mine. I had all but given up on trying anything else when the sound of the mod came as such a disappointment but decided as the mod was so easy there was room for experimentation. I ended up with a personally pleasing result with a thin woollen covering of the driver ring. I had no idea that my designer friend had come to the self same conclusion. The HD800 is known as a picky headphone to amp. 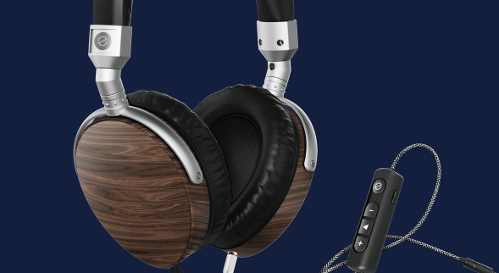 Many discussions have ensued as to the best match for this headphone, and of course the best sounding match may not be so for everyone . Indeed there are so many options one could not get through them all. The needs of the HD800 are different from the needs of the HE-6 , the Senns are more sensitive and can be accused of some harshness. Dillan believes that with the HD800s to sound their best we need to be thinking of lots of voltage as opposed to lots of current. His design is based on this principle. We listened to the amp at length and we were both really satisfied with the results. The HD800s sound wonderful with this amp. Again I find it difficult to explain to existing users who are getting so much pleasure from their own own setups which they have tailored to their own needs over perhaps many years. All I would say is, please get a chance to listen to this set up if Dillan takes this to a show. To me I have never heard the HD800s sing like this. 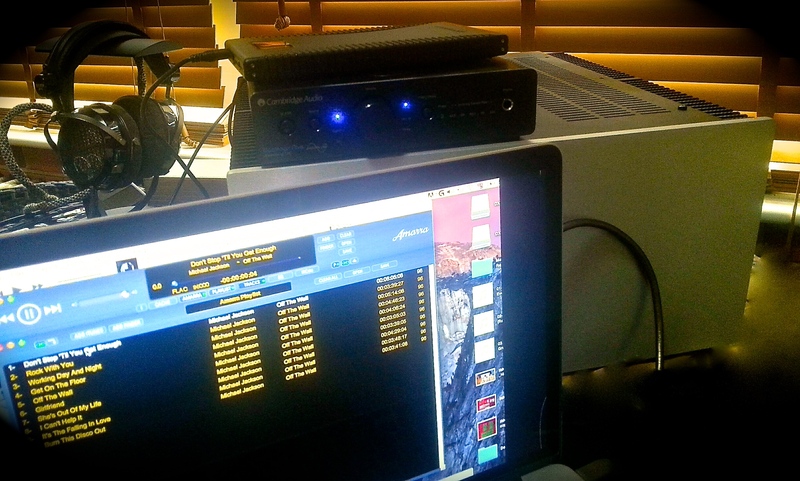 A DX100 or MacBook Pro hooked into a Cambridge Audio DacMagic Plus provided the source. This , I’m sure, could be even better were the source changed for the better. Further experimentation took place this time in the software of our music player, Amarra. The Harman Standard EQ on the HD800s courtesy of a YouTube video from Tyll of Innerfidelity and Bob Katz was carefully studied and a match to the response curve was duly best guessed by Dillan and put onto the Amarra’s EQ setting and a comparison was set up using a track “Boys of Summer” by Don Henley. The Album from which that most memorable single emerged is entitled - “Building the Perfect Beast”…..
and I was fiercely against any alteration of that quality up until the point I heard the difference. As this is achieved through an EQ setting, there is everything to be gained and nothing to lose as it can be switched back and forward at will with no permanent changes necessary. Worth a try. A fitting end to my tale for now. Having satisfied myself as to what the HD800s are capable of as far as Dillan has gone at this stage, we both realised it was time to see whether they had improved on the HE-6. it was time to turn back to the HiFiMan. Boys of Summer came on again and we changed heads or rather swapped the HE-6 between us. It was still like listening to a different track to my ears ; as amazing as the 800s were. Maybe Dillan can tell us all a thing or two when it comes to Building the Perfect Beast. pedalhead, nick n, Turrican2 and 1 other person like this. Thanks for your comment @audionewbi . I have a version of the First Watt F6 Dillan built for me , he changed a few components for ones he preferred the sound of. A review will be up for that once I have had long enough with it to properly enjoy it. Stay tuned! How's that review coming along, Trev? I've heard it. I know how beautiful that First Watt F6 build sounds with the HE-6.